"Wine and women," says Caleb Followill, with a thoughtful sigh. The 27-year-old singer and guitarist for Kings Of Leon is pondering the nature of art - songwriting, in particular. He lets out a throaty laugh and says, "I guess that's why '...and song' always follows those two. There you go - 'wine, women and song.' Nobody will ever improve on that, now, will they?" Perhaps not, but Caleb and the rest of the Followills who make up Kings Of Leon (there's brothers Nathan, 29, on drums; and Jared, 22, on bass; along with their 24-year-old cousin Matthew on lead guitar) are certainly putting their own unique spin on the centuries-old formula, and in the process have become the hottest band in the world. "See, that just blows my mind," says Caleb, sipping midday coffee ("I'll do my drinking later") in a hotel room in Pittsburgh, Pennsylvania. "Biggest band in the world. Hottest band…greatest band…"
He hears his own words in his head for a second, then says, "But on the other hand, why the hell not? I mean, who in their right mind forms a band with the goal of being totally average? That would just be foolish." 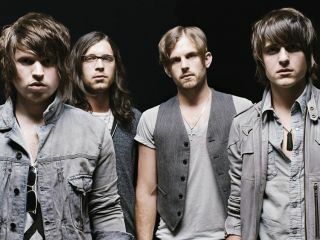 With over three million copies sold of their latest effort, Only By The Night (and the numbers are increasingly at a rapid pace), foolish is the last thing anybody would call Kings Of Leon. Since the album's release, the group's firm hold on the UK and Australia has spread across the globe, to the point where they're now on the verge of going platinum in their homeland. "Now that's some sweet justice for you," says Matthew, dragging on a Marlboro Light while drinking a strange combination of Heineken and Coke. "Believe me, we've worked our butts off and we love our UK and Australian fans. But I'd be lying if I didn't say it doesn't mean something special to make it in the States. Home is home, you know?" From the moment Kings Of Leon issued their 2003 gritty Southern rock debut, Youth And Young Manhood, much has been made of the Followill's backstory (Caleb, Nathan and Jared spent much of their childhood traveling the deep South with their United Pentacostal preacher father, Ivan). What hasn't been addressed to such a degree is the manner in which the band, formed before half of them were old enough to drive, makes music. Which is precisely what MusicRadar set out to do in the following podcast interviews when we sat down with Caleb and Matthew hours before they were to storm the stage in the land of the Steelers, Pirates and Iron City Beer. For the entire Kings Of Leon interview, be sure to pick up the August 2009 issue of Guitar World magazine, available 7 June. Special thanks to Chris Vinnicombe for his assistance with this article.